Note: US Airport codes begin with the letter "K" but we drop it for simplicity. We use the four letter ICAO (International Civil Aviation Org.) codes which are different from the three letter IATA (International Air Transport Assoc.) codes used by airlines. Just a bit of trivia to impress your friends. The private air terminals (FBO) we use for the Orlando airports are all very nice and offer excellent service. You should stop by, even if you're not on an air taxi flight. Just walk in, have a look, and tell the friendly lady at the counter that you're checking out their facility for a future flight. For Kissimmee we use the Ranger Jet Center FBO (FBO means "Fixed Base Operation" - a term taken from barnstormer days when pilots and planes were transient businesses. Later, new regulations and licensing requirements encouraged many aviation businesses to be "fixed" in one location to distinguish them from transient operations). So, to sound savvy in private aviation, say "hey, what FBO shall I meet you at?". Another nice place to meet your Air Taxi flight is Signature FBO at MCO. 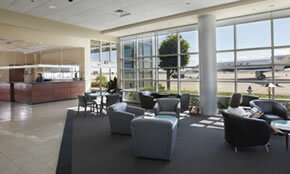 Signature FBO is one of the largest FBO chains in the US. They provide premium services to mostly private jets. The service provided by Signature's MCO staff and facility are excellent. These private FBO's are also very accessible. 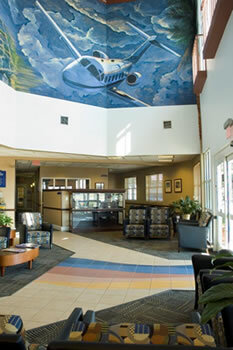 Unlike the airline terminal, you can drive right up to the FBO lobby or park nearby. Walk in and enjoy a free coffee or tea. It's a completely different experience from the crowded airline side of the airport. At the Orlando Executive Airport there are two FBO's we use (some of our Air Taxi customers prefer one or the other), Sheltair FBO and Showalter FBO. Sheltair is located on the west side of the Orlando Executive Airport which I find convenient for quick travel to downtown and access to nearby restaurants. 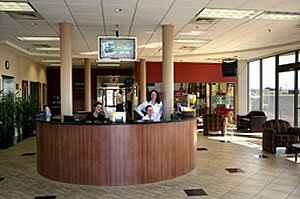 Showalter has been at this airport since 1945 and has an excellent, experienced staff. Note: Showalter FBO was acquired by Atlantic Aviation another excellent FBO with great service to passengers and private aircraft. All these FBO's provide rental cars (for both pickup and drop off) much easier than at the airline terminal. Plus your car will be waiting by the plane when you arrive. Or, of course, taxi's and car services are available too. These FBO's are very much like concierge services. In addition to arranging your ground transportation, they also can arrange hotels at prearrange rates too. Although this service is normally for used by pilots, passengers can take advantage of this too. Just ask us when you book your flight. As you can see, there are plenty of options in Orlando if you're flying in and want to get close to your final destination. Make good use of what's out there so you can spend more time shopping, sightseeing, or doing business.